You are a knight named Eric, and you seem to have an unfortunate tendency to screw things up. After an especially bad blunder, the shop steward of the Knight's Union decides the only task you're suited for is to visit a farmer whose daughter has been turned into a pig, and break the enchantment by kissing the pig. You begin the game in the farmer's yard, holding a work slip to be signed by the farmer after you've completed your task. 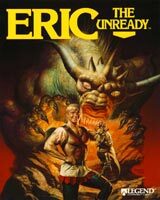 Eric the Unready (Bob Bates; publisher: Legend Entertainment; 1993). Included in the eight-game compilation The Lost Adventures (Legend Entertainment; 1997).